The Battle of the 1000 Heartless, also known as the Battle of the Hollow Bastion, was a major battle in Kingdom Hearts II. It featured countless Heartless attacking the Hollow Bastion Restoration Committee and their settlement in Hollow Bastion. Organization XIII purposely began the war to collect more hearts for Kingdom Hearts by using Sora and the Keyblade's power to release hearts. Maleficent also participated in the battle in an attempt to seize the world as hers again. The Organization used Nobodies in the battle to rid Maleficent's weaker Heartless. After the battle, the Organization makes a final push to obtain hearts and recruit powerful Nobodies, while Sora, Donald, and Goofy move to combat their goals, eventually arriving at the Organization's stronghold at The World That Never Was. The battle at Hollow Bastion in early trailers. In the cutscene prior to the battle, Sora, Donald and Goofy wield their basic weapons (Kingdom Key, Mage's Staff and Knight's Shield, respectively). However, when the fight starts, they carry their equipped weapons. This is because the cutscene was pre-rendered, probably because of the high amount of objects in the area. The promotional trailers for Kingdom Hearts II depicted Sora, Donald, and Goofy running towards the horde of Heartless, which included a new kind of Behemoth and several Final Mix-design Wyvern. The Behemoths and Wyverns were excluded from the final game, although this version of the cutscene appears in the opening of Kingdom Hearts Re:coded. This cutscene is replaced in Kingdom Hearts HD 2.5 ReMIX with the final scene from Kingdom Hearts II. In one interview, Nomura stated that he had almost considered dropping the battle from Kingdom Hearts II entirely, due to the incredible amount of effort needed to program the battle into the game. The battle begins after Sora and company open the DTD dataspace in Ansem's computer and discuss Ansem's identity with the King. When the Bailey is destroyed by the surge of Heartless, the party immediately makes their way there, but they must fight their way out of the halls of the castle to get there. Meanwhile, the Hollow Bastion Restoration Committee makes their way towards the Bailey, and then to the Great Maw, to combat the threat. They ready themselves as thousands upon thousands of Heartless flow toward the town. Aerith aids Yuffie with her white magic skills, casting the Cure spell. Cloud and Leon fight side-by-side against a large crowd of Heartless, both making comments regarding their capabilities in defeating them. Later, Cloud has a short reunion with Sephiroth, then runs off after him just as Tifa arrives. Even Stitch, Yuna, Rikku, and Paine help in defeating the Heartless, although they do not have as much of an effect on their numbers. As Sora and the gang make their way down the Ravine Trail toward the Great Maw, the Committee arrives in various places to help them reach their destination, then disappears to continue the fight. They do not appear again until after the fight, but it can be assumed that they spent most of the time fighting close to the town, defending it from advancing Heartless. They appear to be mostly unscathed, and quickly begin working on repairing the town once more. Mickey, Sora, Donald and Goofy at the Great Maw. Although a small minority of Heartless attack Ansem the Wise's old castle, Sora and his friends force them back out of the town into the Great Maw. Sora, Donald and Goofy catch up with King Mickey in the Bailey, and defy his orders, running off to help their friends. Upon reaching the Castle Gate, they encounter Demyx, whom they had previously met in the Underworld at Olympus Coliseum. After a long battle, Demyx falls and fades back to darkness. Mickey catches up with Sora, Donald, and Goofy, revealing his intention to help them. However, a Surveillance Robot's laser hits a boulder which hurtles towards Mickey, but Goofy pushes him out of the way. Goofy is hit on the head by the boulder instead and is knocked unconscious. Goofy's subsequent failure to respond to Sora and Donald's attempts to wake him lead the two of them and Mickey to believe he is dead. Enraged, Mickey, Donald, and Sora charge into the battle. Sora is then helped by Yuffie, Leon, Tifa and Cloud to rid the Heartless. However, after the battle through the Ravine Trail, Sora, Donald and Mickey discover that Goofy is alive. The group then moves into the Great Maw, where they finally behold the leader of Organization XIII, Xemnas. Mickey runs off to confront Xemnas. Before the others can follow, they find themselves surrounded by a great Heartless army. Sora, Donald, and Goofy split up to finish off the numbers quicker, and a great battle ensues, leaving only the three warriors of light standing. The trio eventually catches up with Mickey. After hinting that the king may know more about Riku's whereabouts than he is letting on, Xemnas makes his departure and Mickey gives chase, both vanishing in a Corridor of Darkness. The three remaining heroes then encounter Axel, who attempts to help them by revealing the Organization's plans before he is stopped by Saïx. Saïx reveals the stratagem of Organization XIII: the Organization wishes to use the power of Sora's Keyblade to capture the hearts of the Heartless, using them to build a new Kingdom Hearts. The power of Kingdom Hearts will then enable them to obtain Hearts of their own. Saïx also reveals the Organization's ability to control the Heartless, using them to attack Sora in an effort to obtain even more hearts. Maleficent suddenly appears and summons more Heartless in an attempt to defeat Saïx, which are easily countered by the Nobodies he calls afterward. Maleficent then sacrifices herself to defeat the Nobodies, after which Saïx summons his Heartless once more and resumes his attack on the party. When Sora refuses to fight them, knowing that the Hearts he extracts will end up in the Organization's hands, Maleficent sends them away to a Corridor of Darkness, ending the battle. In the wake of the battle, Maleficent's power over the Heartless is effectively broken. Organization XIII is able to take control of them, and begins sending them to the worlds which Pete had previously visited. In the Corridor of Darkness, where Maleficent sends the party after the battle, the trio obtains several critical clues that eventually lead them to Twilight Town, and ultimately to The World That Never Was. Even though the Hollow Bastion Restoration Committee wins the battle, Sora begins to question whether he should keep fighting the Heartless knowing that Organization XIII would take the hearts of any he would defeat. However, Goofy reminds him that to do nothing would allow the Heartless to continue taking over worlds. Sora must defeat exactly 1000 Heartless alone. Although the Armored Knights are not exceptionally strong, their large numbers, compounded with Sora being alone, can make them difficult to defeat. These Heartless are in fact weaker than the normal variety found, possessing less HP and weaker stats. Because of this large number of Armored Knights, the battle can take a long time to complete. However, the battle can be made much easier by using Reaction Commands. Sora can perform the 'Rising Sun' Reaction Command, which lets him attack large groups of enemies and devastate them. The Armored Knights can be defeated easily by utilizing this technique. To make matters easier, Sora can grab the Surveillance Robots around the area and use them in the 'Snag' and 'Sparkle Ray' Reaction Commands to attack the Armored Knights and other Surveillance Robots. If the player wishes to use magic in this battle, he should equip a good amount of Ethers before the battle and keep them in the Shortcuts menu. The player should also select spells such as Thunder and Magnet and put them in the Shortcuts menu. When the actual battle begins, he should spam Thunder, and then use an Ether on Sora. If the MP bar is still pink in color, attack like normal. For crowd-control lovers, Magnet is a great spell. The Explosion ability is also highly effective, clearing out a decent radius of foes while not requiring MP. The battle is even easier in Kingdom Hearts II Final Mix due to the addition of Limit Form, which can be activated without any allies. Aside from its powerful attack capabilities, reverting out of Limit Form immediately after entering it grants the player full MP and HP bars. Furthermore, using Vicinity Break on the swarms of enemies is an easy and efficient way to quickly build your Drive Gauge. 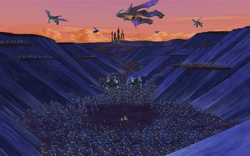 A glitch may occur during battle, where the Rising Sun Reaction command causes Armored Knights to become lodged in the mountain scape surrounding Sora, ceasing the ability to use physical attacks. This can be rectified by casting Thunder until all of the enemies are defeated. Another battle featuring 1000 Heartless can be found in the Underworld as match 45 in the Hades Paradox Cup. Like the Hollow Bastion one, it also features Armored Knights and Surveillance Robots.